Past District Governor of Rotary District 1030 RIBI Terry Long, Past Presidents of Alnwick Rotary Club Marion Long and Elaine Smith and Rotarian Graham Smith visited Sri Lanka once again in January 2017. 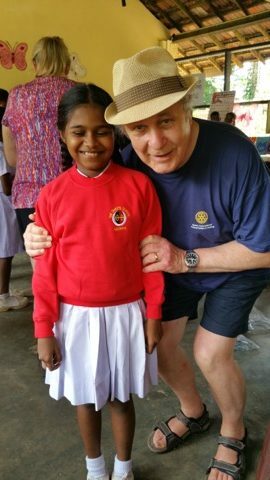 They attended a meeting of the Rotary Club of Colombo Mid City and had a highly successful visit to the Primary and Pre-schools at Mapalagama. The building project at Mapalagama was supported by the Rotary Club of Alnwick and District 1030. The Rotarian Team presented gifts and equipment to the school including a set of school sweatshirts from Duke Middle School in Alnwick and some descant recorders for the school band.